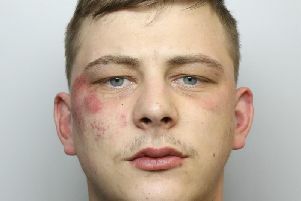 A drunken man threatened two girls with an eight inch long screwdriver after following them in Dewsbury town centre, a court heard. When she told him to shut up he said she had a “nice a*se”, Mehran Nassiri prosecuting told Leeds Crown Court. The girls became scared and one of them told him to go away. He began to do so but then produced the screwdriver. She and her friend walked away from him down a subway but he continued to follow them shouting he was going to “screw” their faces. They saw a police community support officer and reported what had happened. Two officers then arrested Allott who was found to have on him the screwdriver, an aerosol can and a can of cider. He admitted threatening some Asian girls claiming they had threatened him and said he had the screwdriver because he collected scrap metal and used it to unscrew items. He said he had sniffed glue as well as drinking. She said he had been warned he would end up killing himself if he did not stop drinking and was willing to accept any help from the probation service and was receiving support from his girlfriend and family. Allott, 46 of Fieldhead Gardens, Shaw Cross, Dewsbury admitted two offences of threatening behaviour, possessing an offensive weapon and was given a 12 month community order with a 30 day activity requirement and a six month alcohol treatment requirement. Recorder Peter Babb told him when he accosted the girls in March he subjected them to an unpleasant experience but it was clear alcohol consumption had “bedevilled” his life.